Like the beautiful "Stories We Tell," directed by Sarah Polley, "Elena" is an extremely personal documentary directed by a young filmmaker in search of her past—or part of it. It is a bold plunge into painful memories, unasked questions and wounds still inflamed. It is, in short, crying in the form of a movie, but also an embrace of comfort. While trying to (re)discover the sister that died when she was only seven years old, director Petra Costa finds herself and, in part, her own mother. In the process, she involves the audience thanks to her openness, which allows us to glimpse, in melancholy, the journey of a young and talented director toward the catharsis that will require so much pain to occur. Using several images recorded on VHS by Elena during the '80s, when she fantasized of being a movie star and in which we can witness the tenderness she devoted to her baby sister while, for instance, taking a nap with her in a comfortable embrace of love, the movie is an open scrapbook, a collage of memories. We see Elena in her infancy, dancing with the charmingly clumsy ways of a child, but also when she’s already a young adult and had found the grace and femininity of a dancer prepared by extensive rehearsals. In a scene, she appears excited after realizing she could make the moon “dance” by moving her camcorder; in another, she can be seen completely focused in a rhythmic choreography with a rope that suggestively wraps around her body. Through this collage of files, Petra Costa illustrates—without ever having to spell it—the dedication of her older sister to her art, which would lead her to New York with the objective of developing herself as a performer. "Art is everything to me. Without art, I’d rather die," sobbed Elena, in anguish, for not being able to see herself actually achieving her artistic dreams, but becoming a victim, in fact, of an insidious depression and of her young age, which prevented her from foreseeing what the future could bring her. What she certainly didn’t imagine, however, was that her pain for art would be represented in her younger sister’s art. And, in that sense, when Petra includes in her movie raindrops running through the window of the plane that is taking her to New York, we see them as Elena’s tears over the city in which she would cease to exist. Moreover, by showing herself walking in the streets of the metropolis in shots with small depth of field that allows us to see only her back, Petra becomes an avatar of her sister or at least a representation of her precociously extinct possibilities. In this sense, "Elena" is not only an investigation into the title character, but also about its director: when she talks about her mother’s youthful dreams of success, for instance, Petra barely seems to contain her admiration, allowing us to hear the smile in her voiceover. Incidentally, it’s impossible to avoid feeling pure admiration for Petra and Elena’s mother. While boldly revisiting her actual nightmares from the past, she still reveals a world about herself when she stops during a painful testimony to point out the beautiful colors of a nearby tree—allowing us to realize the origins of her daughter’s sensibility; they were raised to appreciate beauty. On the other hand, the tears left by Elena’s demise are obvious in those sad eyes that so afflicted Petra during her childhood, leading her to feel compelled to cheer her mother and to strive to protect her in a poignant reversal of roles that, in turn, explains the melancholy in her own expression (or expressions: the literal and the artistic ones). 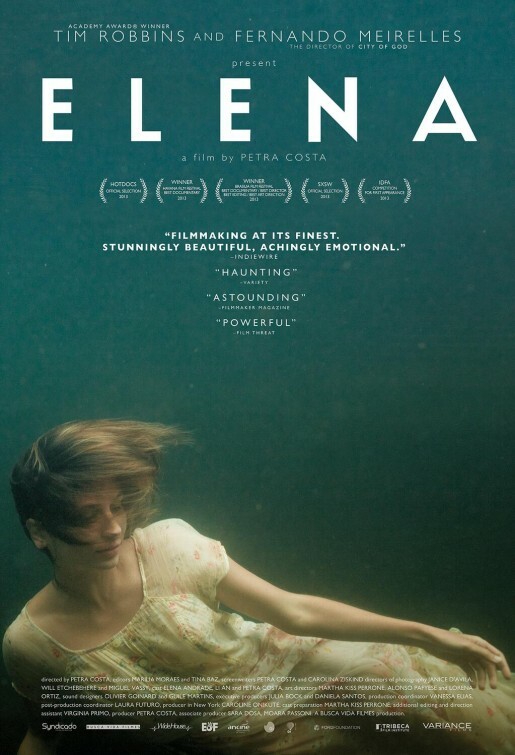 Thus, "Elena" is a film that reveals deep feelings of guilt: when remembering a friend who, upon seeing her older sister wrapped in sadness, asked what was wrong with her, Petra quotes her youthful version with a clear sharp pain: “She’s like that” was the direct and simple answer so typical of children. The subtext, of course, is a mea culpa: Why didn’t I do more? Why didn’t I say anything? Why did I resign myself to Elena’s sorrow? And the obvious answer ("Because you were only seven years old") surely occurred to the filmmaker, but it’s still, understandably, unable to console her. Likewise, the girl’s mother recalls the sobbing of her eldest daughter in pain and blames herself with a simple "And I didn’t go talk to her" that may seem a serious mistake in retrospect, but that could hardly have been avoided—which, again, is no relief, leading her to say that Elena became her "inconsolable memory" (and what a painful sentence that is). It is only natural, therefore, that the film ends up expanding beyond memories about Elena and becomes a psychological investigation into the effects of a woman's death on her mother and sister. So, when we see Petra and her mother floating in murky water alongside many other women that flow tangled in each other, we see several Elenas, Petras and Mothers in mourning, all intertwined into one block of pain and dreams, but also hope. After all, the current carries them forward. "The heart weighs 300 grams," said her autopsy dryly, without realizing that this was the weight only on the scale; inside Elena's chest, it weighed a ton. Pablo Villaça interviews Fernando Meirelles about Elena from Petra Costa on Vimeo. Next Article: Crossing the Line: The Definition of a Prankster Previous Article: Directors’ Fortnight: Violence in "Cold in July" and "These Final Hours"